Frank’s First Week on the t:slim! Frank still can’t believe that he has a t:slim tucked away in his left pocket. (In his determination to get a t:slim, Frank has even began referring to himself in the third person in his own head, which he really should stop doing now). As trusty and reliable as my late Animas Vibe was, it was definitely outdated. Quite frankly, it looked like a game of tetris from the ‘90s. It wasn’t particularly attractive. The skin quickly began to peel. It wasn’t particularly easy to navigate, when compared to the smartphones we use today. Animas had failed to throw research and development at that pump to bring it into the 21st century, which is likely a big part of why they decided to exit the market. I know all of these things may sound superficial, but when you’re talking about a $9,000 device that is attached to my body 24 hours a day, it really does matter. I’ve only been using this pump for a little over a week, but quite honestly the transition has been seamless. 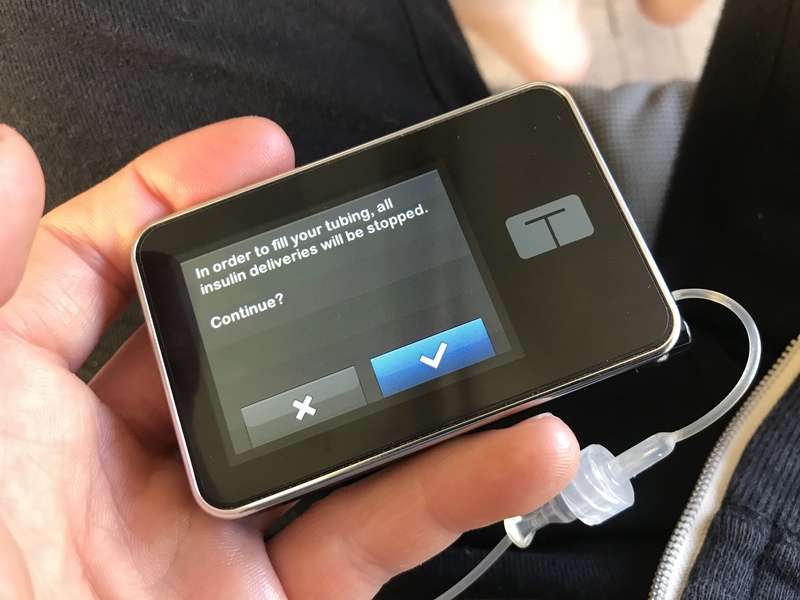 The t:slim combines the features that I’ve come to rely on in my Animas Vibe, with many enhancements that I’ve been longing for in quite some time. The bright touch screen on the t:slim is so much more convenient and sophisticated (although not exactly easy for oversharing bloggers to photograph). I am no longer reliant on up or down buttons to navigate through the pump. I no longer need to scroll to reach my desired number to input into the pump. I can simply touch the menu item on the screen, and type in my numbers. Another feature that is proving useful is the basal profiles. Within each time segment, I can also set custom carb ratios and correction factors. So when I’m on my feet at work at 9am on a Monday morning and more sensitive to insulin, I can set a custom carb ratio to reflect that, rather than having to manually adjust every single time. Thoughtful little things like that really do make a difference to my life. I’m also really happy with the wearability of the pump. When I’m at work, it truly is slim enough to tuck into the waistband of my trousers, leaving my pockets completely free. While it is a little heavier than my late Animas Vibe, it’s hardly noticeable thanks to its size and sleekness. A big shift from Animas is the rechargeable battery. Unlike a smartphone, I have been told that I do not need to worry about damaging the battery with my charging patterns. I’ve been plugging it in before I jump into the shower every day. It charges super fast, and so far that ten or fifteen minutes in the bathroom keeps the pump battery topped up at close to full capacity. I’m really happy that I can continue to use the Animas sets that I’m most comfortable with, so no massive adjustment needed there. The nobbly luer lock connection, which was concealed on my Animas pump, is a little annoying when I go to tuck the pump line away or pull it out again. But it does guarantee me lots of options should I need to switch infusion sets in the future. 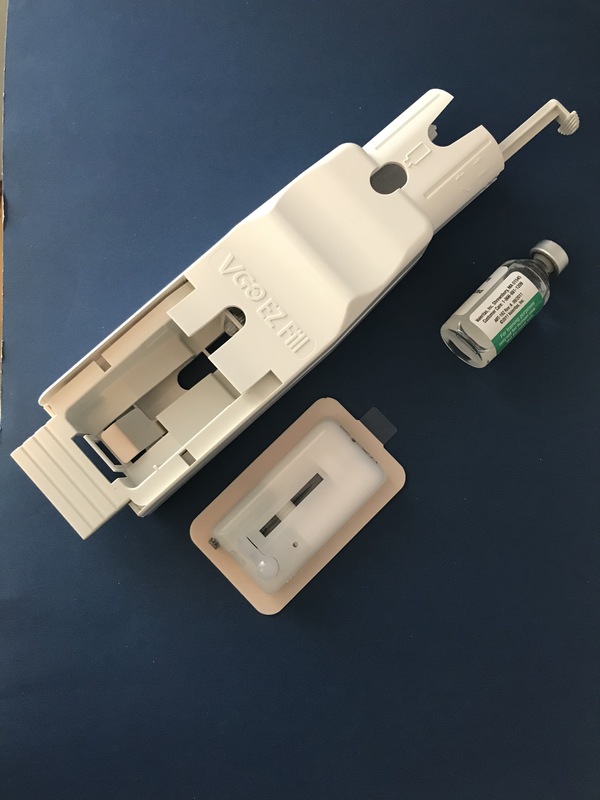 Filling an insulin cartridge is a little different as well. Insulin is basically drawn into a syringe, and then injected into that little white hole at the top of the cartridge (next to the line). Given that I can’t see inside the black insulin cartridge, the key is making sure there are absolutely no air bubbles in my syringe. I’ve only filled a cartridge twice so far, but it seems simple enough. 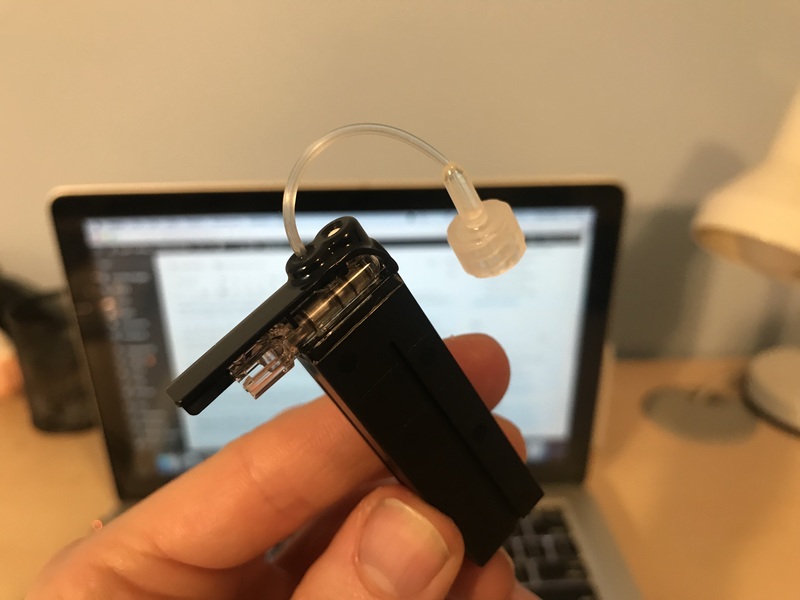 Most of my bolus deliveries take a good minute or two to complete, due to a back and forth motion happening inside the insulin cartridge that slowly infuses bolus deliveries. It’s just something to be mindful of when delivering a larger bolus. The one thing I dislike about my t:slim is the pump clip, which I have been unable to use. The clip is attached to the rather chunky t:case, rather than the pump itself. This doesn’t exactly make the t:slim all that slim! Another irritating thing about this pump is how demanding it is. The screen blacks out with three mis-taps. I’m frequently alerted when I don’t complete a bolus, or if I’ve been running a temporary basal rate for a prolonged period of time. 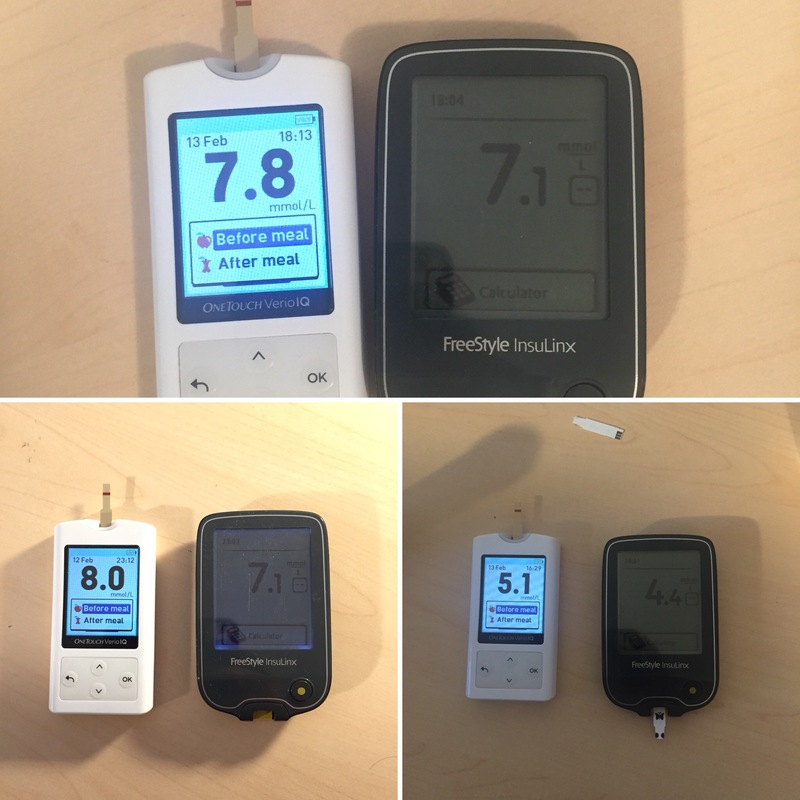 While these may be helpful to some people, my pump should be able to realise how switched on I am. While pump data can be uploaded to Diasend for review, I’m also looking forward to the t:connect app eventually launching here in Australia. 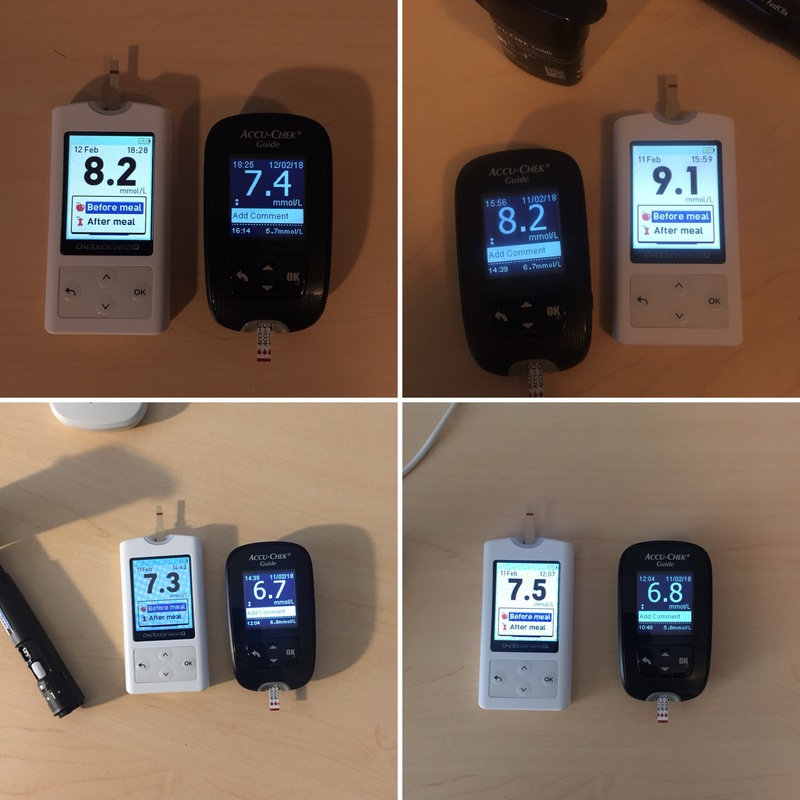 Just like wireless blood glucose meters, it’ll be great to wirelessly sync my pump data to my iPhone for instant review. It’s still early days, but it’s hard for Frank to find much fault in his t:slim. 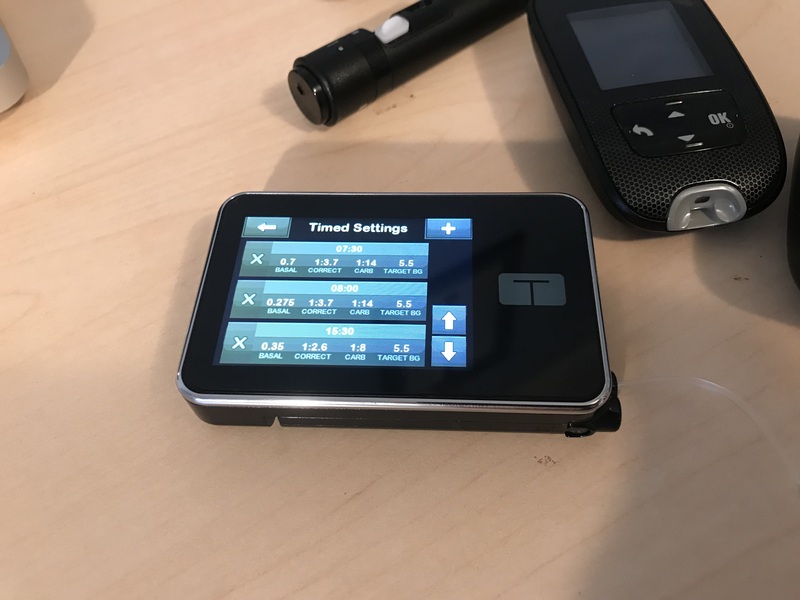 It’s nice to finally have an insulin pump as modern as my smartphone and the other devices that I use to manage my diabetes. Disclosures: AMSL Diabetes bumped me up to a priority transition to the t:slim after seeing all of my cheeky #TslimForFrank comments on social media. As an existing AMSL customer using an in warranty Animas Vibe, I was eligible for a free upgrade to the t:slim as per their transition program. The upgrade was treated as a replacement for my late Animas Vibe, which I was required to send back. I have not been asked or paid to write about the t:slim, and these opinions are entirely my own. 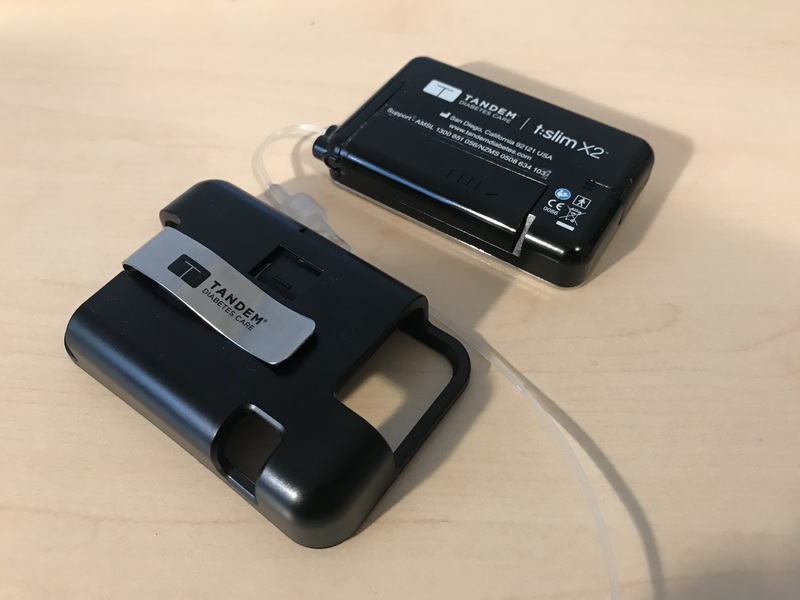 Tandem t:slim X2 Insulin Pump Launches in Australia! 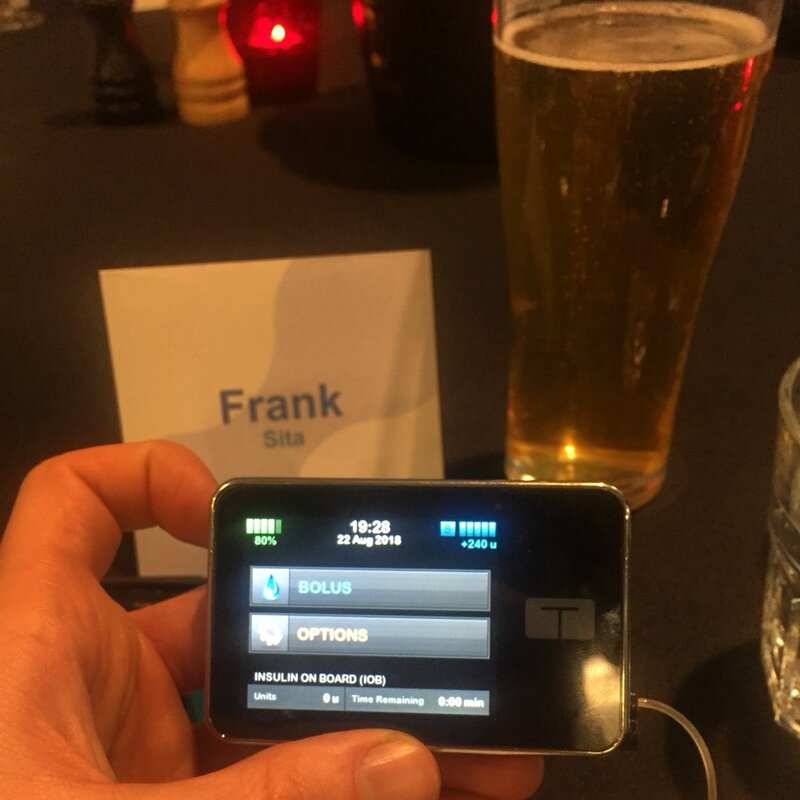 Tandem’s t:slim X2 insulin pump officially hit Aussie shores last week at the Australasian Diabetes Congress. 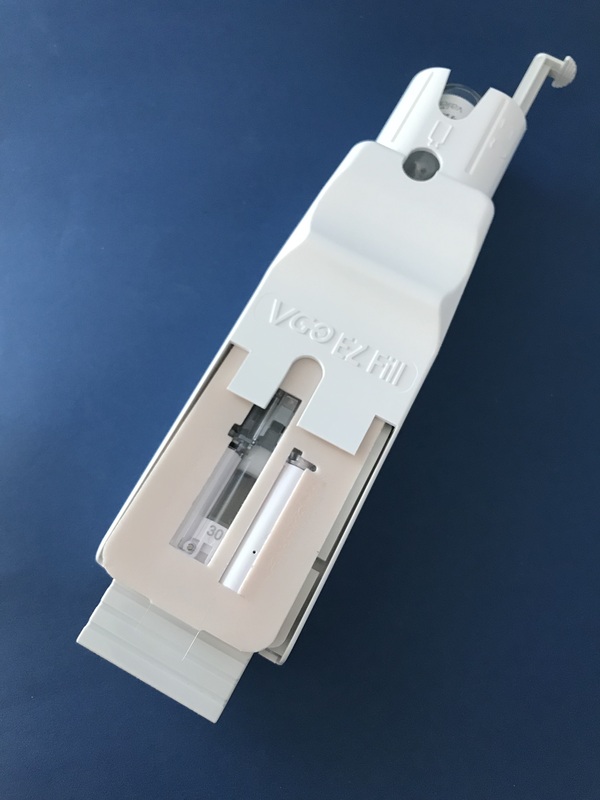 It will be distributed by AMSL Diabetes here in Australia as a successor to Animas, which is in the process of exiting the pump market. 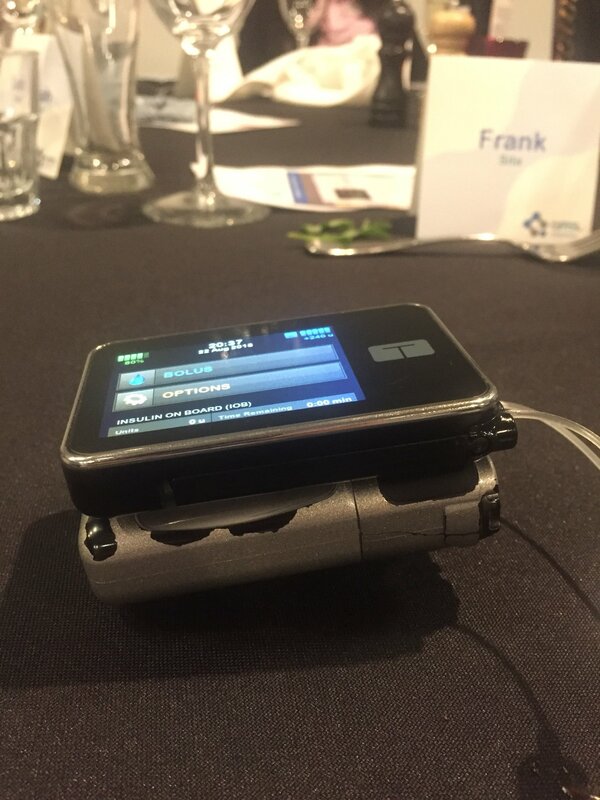 AMSL invited me to a launch dinner in Adelaide last week, where I had the opportunity to play with (but not keep) this new diabetes toy. 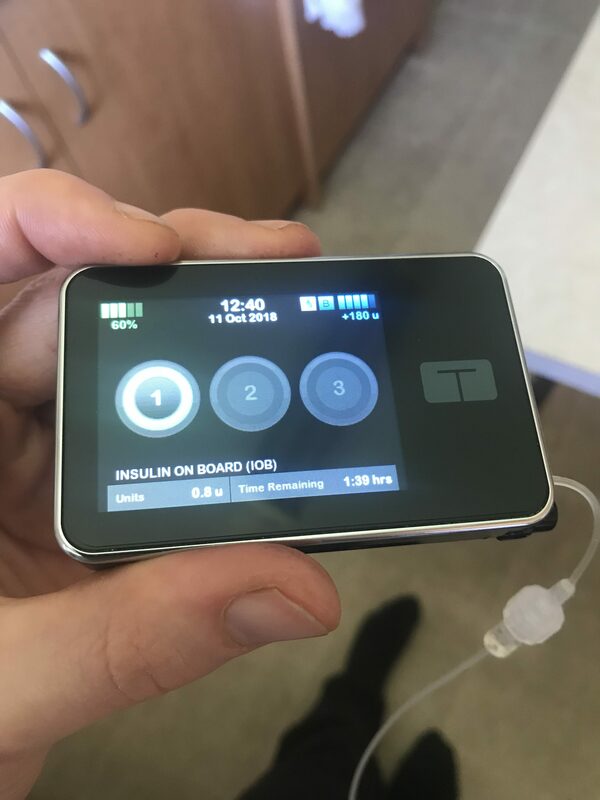 AMSL diabetes will be upgrading all of their customers with an existing, in warranty Animas Vibe insulin pump to the t:slim over the course of the next 12 months at no extra cost. Customers will need to return their old Animas pumps within one week as a condition of receiving the upgraded pump. This is a part of AMSL’s contract with Animas. This upgrade is basically treated as a replacement for the pump I have already paid for two years ago. Then, in two years when my warranty period is up, I will be eligible for another through my private health insurance. It makes complete sense. Besides, AMSL will only have limited capacity to service Vibe pumps now that Animas have gone out of business. AMSL have a dedicated transition team looking after upgrades, and they will be getting in touch with eligible customers over the next twelve months. You will need to go through a healthcare professional, which is regulatory, but frustrating considering I already know how to use an insulin pump! I hear that upgrades are expected to commence in October, however customers who wish to remain on an Animas Vibe will also be supported. During the evening we heard from Aymeric Lecanu-Fayet, Senior Director at Tandem Diabetes Care in the States. 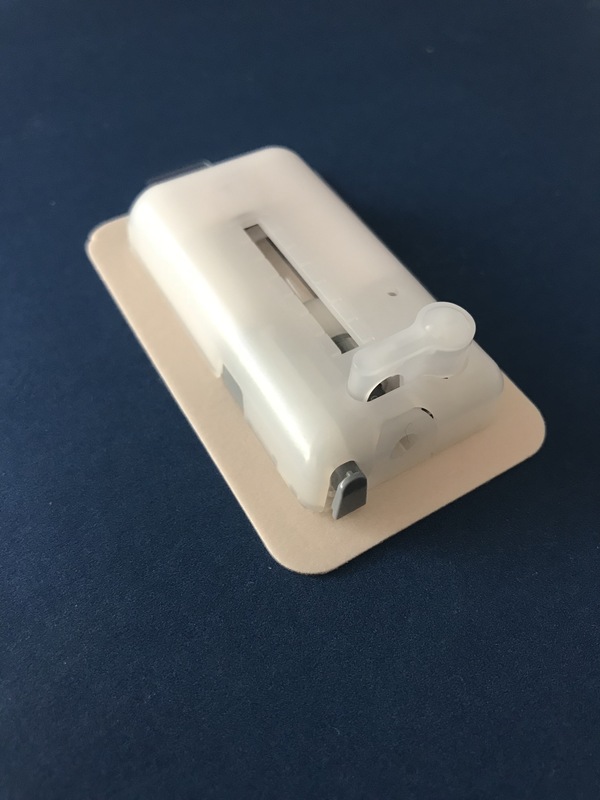 The t:slim was designed based on over 6,000 interviews of people with diabetes, attempting to close the gaps that prevented people from using an insulin pump. Things like making it look modern like a smartphone, easy to use and easy to learn. Kerri Bandelin, International Clinical Manager at Tandem then took us through a workshop with the pump. The tslim has the option of integration with a Dexcom CGM, and the battery is rechargeable. The charge will last for 5 days if you’re using it with CGM integration, or 7 days if you’re using it standalone. The rechargeable battery is also covered under warranty in the off chance that it does get damaged. Those non diabetic lines sure are something to envy! Users are normally encouraged to recharge their pumps while they’re in use. Suggestions were while on the couch, in front of a computer or while in the shower. We were also told that there is no such thing as over charging this pump, something I’m always mindful of when leaving my iPhone plugged in for too long. A full charge takes 1.5 hours on a dead battery, but I also got the impression that short charges of 15 minutes won’t do any damage to the pump’s battery. 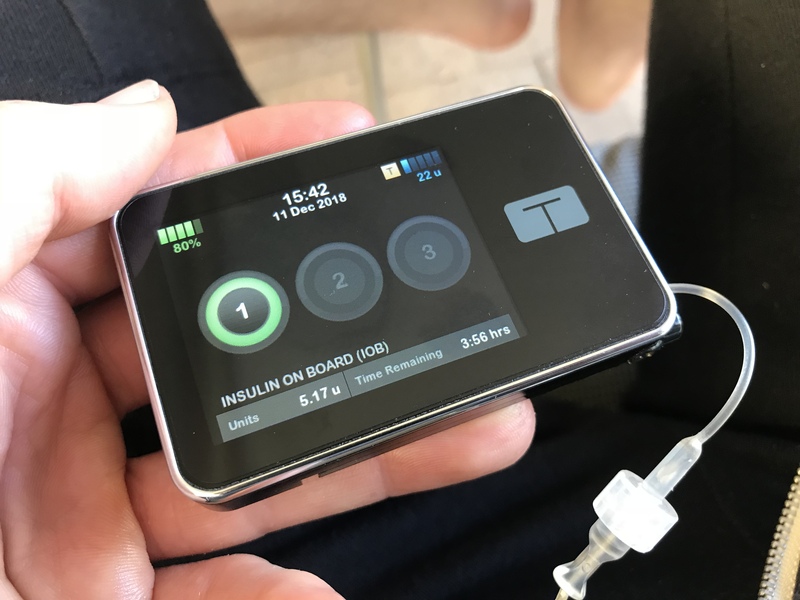 We were told that the pump can be used with Animas infusion sets, but not insulin cartridges. Tandem consumables are on the ship as we speak, and I’m pleased to hear that there will be an option of angled sets. I was also pleased to hear that Australia will be receiving t:slim pumps with an updated algorithm that won’t trigger unnecessary occlusion alarms. Insulin goes into a black hole, which is a bit concerning for detecting air bubbles. The minimum fill is 95 units, with the cartridge having a capacity of 300 units. We were told that there is also a thermometer inside the cartridge which can alert to risks of spoiled insulin. Carb ratios could be adjusted in increments of 0.1 when going past the 1:10g mark. There are also 6 different basal profiles with 16 different time segments. The most promising feature for me is the ability to receive upgrades to this pump in the same fashion as upgrading your iPhone’s software. 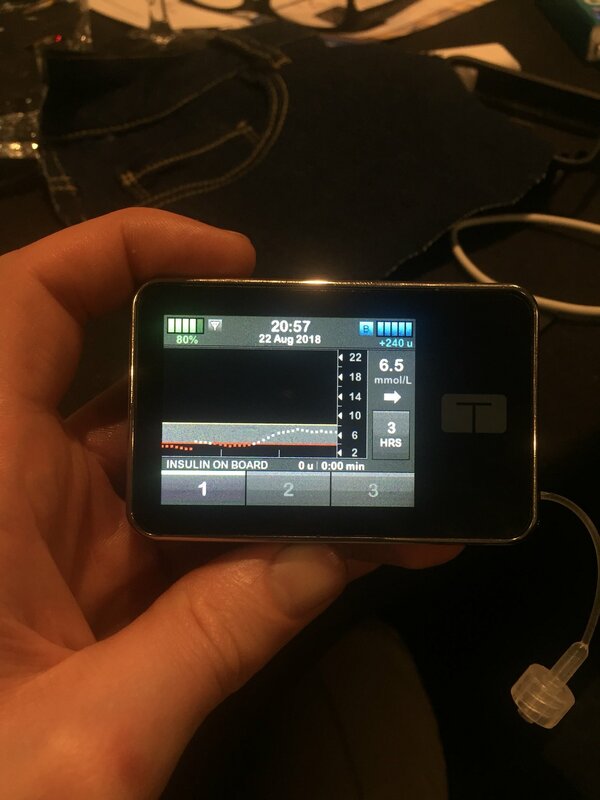 Basal IQ with Dexcom G6 is expected to launch this Australian summer, but is not yet approved. The system predicts glucose levels 30 minutes ahead and suspends insulin if levels are expected to drop below 4.4mmol. We were told that this upgrade would be free, however I wasn’t impressed to hear that I would have to go through a healthcare professional every time there is an upgrade. I know there are regulations. But considering I already know how to use an insulin pump and spend relentless hours managing my diabetes on my own, it definitely feels like an insult to my lived experience. Also in the pipeline is Control IQ. This upgrade would automatically adjust basal insulin levels in response to CGM readings, as well as deliver automated correction boluses. I would stress that this is only in its infancy, with a current 6 month study happening in Germany. Tandem would also not confirm whether this update would be free or not. 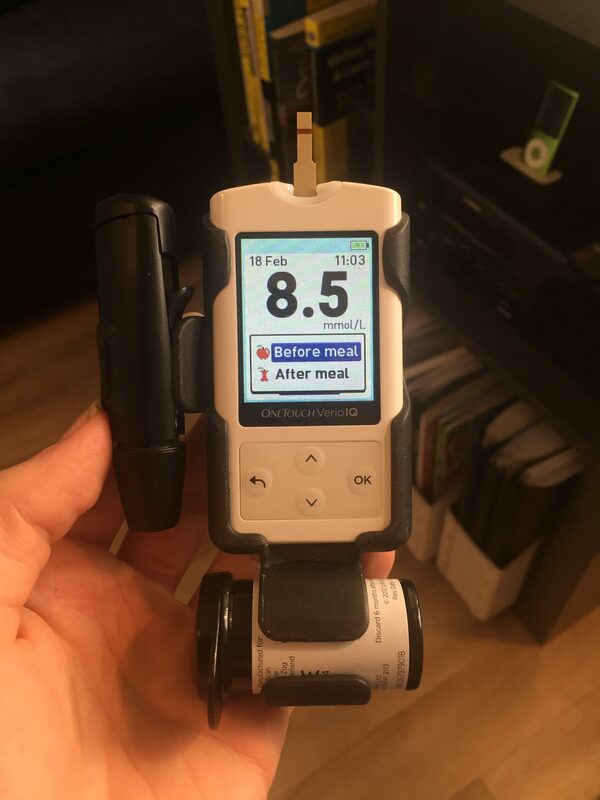 I also got the impression (not an official comment) that the blood glucose target on this system would be better than the 6.6mmol target on the Medtronic 670G. 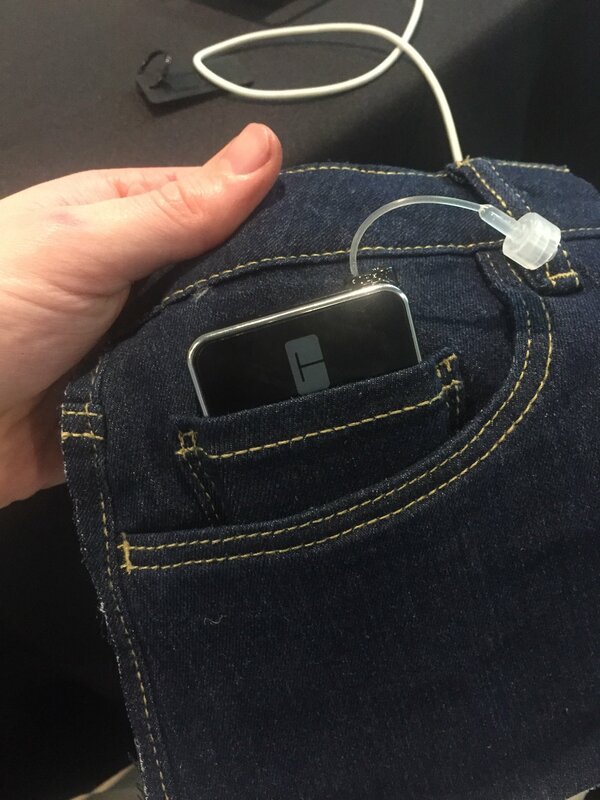 We were told that the pump would fit inside the coin pocket of a pair of jeans. What I didn’t like was the bulky case with a clip that added significant bulk to the pump. It was heavier than the YpsoPump at 113g, and here’s how it stacks up against the late Animas Vibe that I was wearing. We were told it is the size of a credit card. It felt refreshing being able to type in numbers, rather than scrolling through until reaching your desired number. Nice and modern and sleek to use, just like the YpsoPump. While I don’t think CGM will be in my budget anytime soon, I do feel hopeful that we are getting close to finally closing the loop. Finally, we have a hashtag happening. A completely selfish one. Please jump onto social media and use it generously. I have been dreaming of this little pump hitting our shores since forever, and I would love nothing more than to provide you with a user experience. Disclosures: AMSL Diabetes hosted me at a dinner on Wednesday evening with a group of other Aussie diabetes bloggers. I was already in Adelaide for the Diabetes Congress as a guest of Diabetes Australia. I was fed and watered across the duration of the evening, and received a small bag containing a powerbank, information packets and an AMSL penguin. There was no expectation that I would blog about the t:slim. My opinions and my time, including the annual leave I had taken from work to be there, are my own.